It was a cold and snowy December evening in Edmonton and the Alberta Legislature grounds were beautifully lit with million sparkling lights. Jeff decided this was the perfect evening to ask his long time girlfriend Nicole to go for a casual stroll through the park; it was the perfect evening for a winter proposal Edmonton. 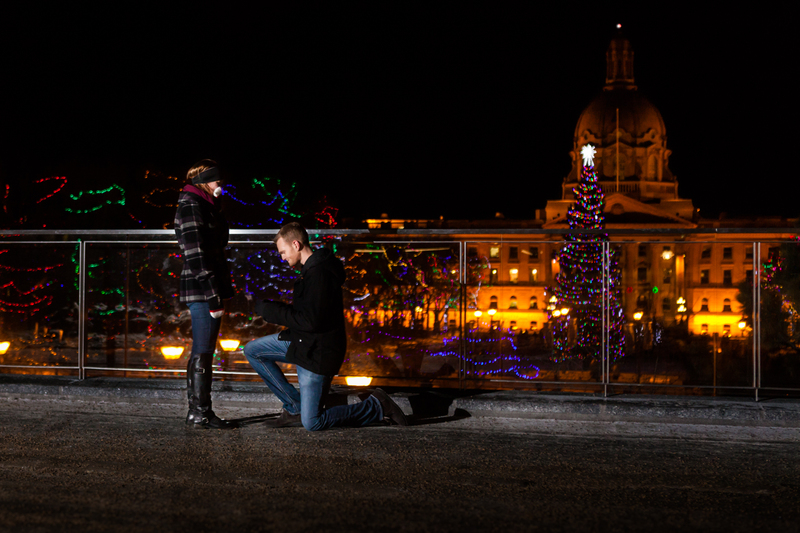 Jeff contacted us in the fall and asked if we could photograph his secret proposal to his girlfriend. He knew he wanted to propose, and he knew he wanted to marry Nicole. We were ecstatic at the opportunity to photograph their proposal and immediately started planning. We chatted via email and phone with Jeff for a few weeks working out all the details to make the evening perfect. Jeff and Nicole were going to out for dinner early in the evening and then he was going to suggest a walk around the Legislature building Edmonton. 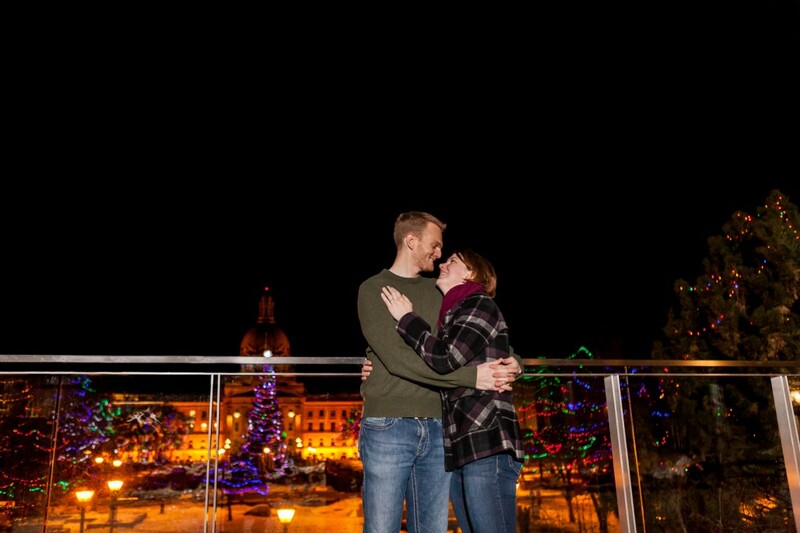 If you have not been to the Legislature grounds in the winter, you really should! It is always spectacularly decorated with Christmas lights and they have Christmas music playing over the loudspeakers. Behind the building they even have a skating rink that is open to the public with heated changing rooms! Anyways back to the proposal! We knew we had to be sneaky and stealthy so that Nicole did not suspect a thing. It was a little tough to be sneaky because we definitely to bring some of our flashes so we could light up the proposal. 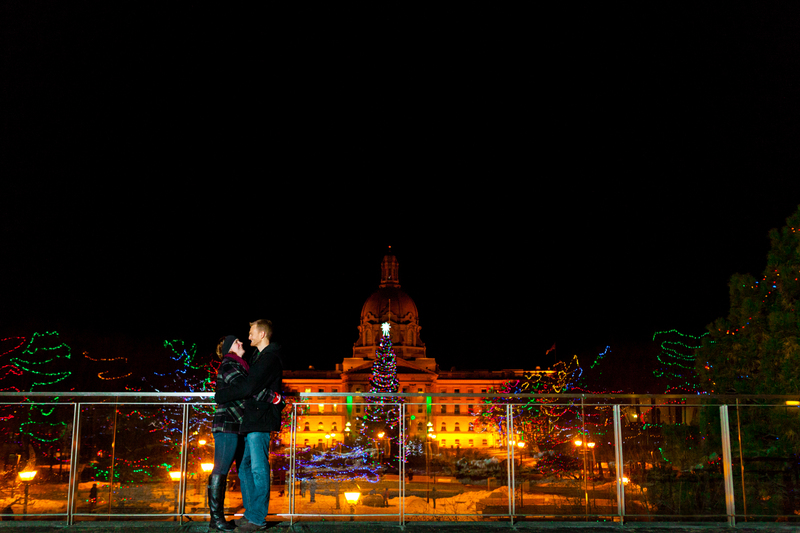 It was dark and very busy at the Legislature, but we managed to find a spot with a great view. Once we were set up we sent Jeff a text message and let him know where we were. We eventually saw them making their way up to our spot. 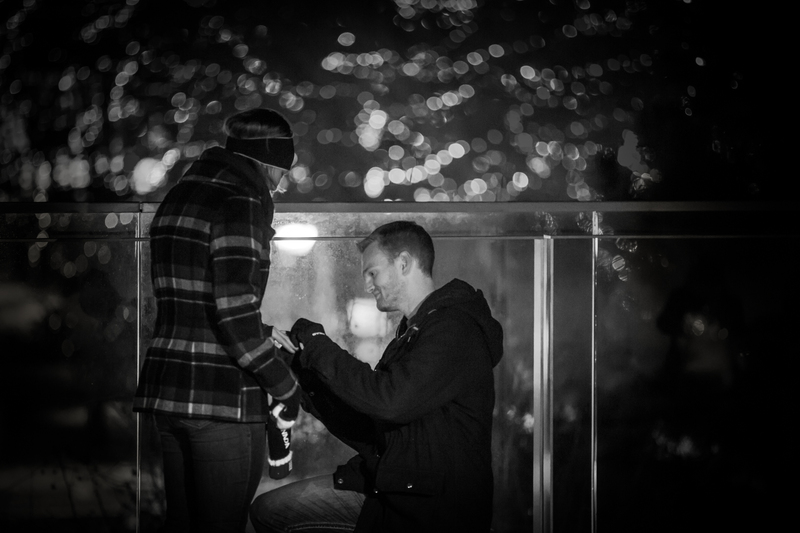 Stopping to take in the view of the lights, Jeff got down on one knee and opened a tiny black ring box and his heart. Nicole, hardly knowing what was happening shouted “YES!” and brought Jeff up for a kiss. Thank you for asking Deep Blue Photography to be there for your super romantic winter proposal Edmonton.